Juicy Stakes Casino has just introduced the first in an exciting new genre of online casino games. The new Max Quest: Wrath of Ra is an interactive action adventure game where players win cash prizes by defeating their enemies. Instead of a slot machine’s spin button, players aim their crosshairs at enemies and instead of pay-lines, bullets strike targets and pay out in coins. This weekend, the casino is giving everyone 500 free bullets to try this new gaming experience. Max Quest: Wrath of Ra, from Betsoft, is a role-playing action adventure game where players battle their way to undiscovered Ancient Egyptian treasures. Bullets and special weapons are purchased for cash. The game pays out when enemies are defeated and when special features are triggered. This weekend, players will be given 500 free bullets, each worth $.01. Free bullets will be available to all players starting November 29th and will expire December 2nd. In addition to winning cash within the game, top players also win bonus prizes. Like a progressive jackpot, 2% of every purchase goes into a prize pool. Players are ranked on a leaderboard and top-ranking players win cash prizes from the prize pool. 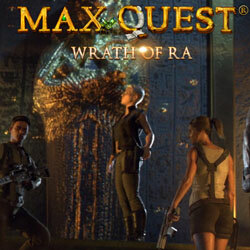 Max Quest: Wrath of Ra is a multiplayer game. Players can team up with to five other players to mow down the unending hordes of cursed monsters. Working together has great benefits and bigger chances of rewards.